President-elect Donald Trump has chosen Dr. Ben Carson, a onetime political rival who became one of his leading surrogates on the campaign trail, to lead the Department of Housing and Urban Development. Carson, who challenged Trump during the Republican primary, is the first African-American selected to serve in the president-elect’s Cabinet. The retired neurosurgeon has little experience in housing or management, but he has weighed in on the issue. In a 2015 op-ed for The Washington Times, he labeled a new fair housing rule a “social-engineering” scheme. Wow, former Republican presidential candidate Ben Carson admitted that Trump attacking him and even calling him a child molester worked. Carson stated that the attacks of person distraction did work to an extent and some people must have believed him. Carson also went on to say he chalked it up to politics. REALLY BEN? Sorry, this is not politics, its disgusting. Which makes Ben Carson’s endorsement of Trump even more surprising. It was not the Cruz campaign’s so-called lies that Carson was getting out of the race that cost Carson votes in Iowa as Trump railed on, it was Trump’s viscous attacks on Carson’s character. The fact that Carson never fought back on such hideous comments was puzzling. Carson was asked this type of attack should be the political norm. Carson stated no, ”but neither should always retaliating.” Actually Ben, this was worth fighting back over. Americans did not think that Carson was a child molester as Trump opined. What Americans thought was, if you are not going to defend your self over such vile personal attacks, how were you going to defend them? I am not sure Mr. Carson if we want this to become the political norm and you just set a precedent for it. Yahoo News and Finance Anchor Bianna Golodryga asked Carson what he thought of some of Trump’s more vicious attacks against him during his time in the 2016 race, citing when Trump insulted Carson’s intelligence and questioning whether or not he was a child molester. The retired neurosurgeon chalked it up to politics. Golodryga asked if this type of attack should become the norm and if, by Carson’s logic, she should teach her son to do the same as Trump did. Well who didn’t see this coming? Dr. Ben Carson revealed on Newsmax TV Monday that he will work in Donald Trump’s administration. Well what did anyone expect after Carson ended his presidential run and the suddenly endorsed Republican front-runner Donald J. Trump? Obviously he was promised something for his endorsement, especially considering some of the vile words that Trump said about the mild mannered Ben Carson. Who could blame Trump for wanting a good man like Carson in his cabinet, I would want him. More importantly, who is surprised, this is what the Trumpster does, he makes deals. If it turns out this is what pushes Trump over the top in Ohio, it just makes the deal simply brilliant. Dr. Ben Carson revealed on Newsmax TV Monday that he will work in Donald Trump’s administration — at least in an “advisory capacity” — if the Republican presidential front-runner is elected to the White House. But Carson, a retired pediatric neurosurgeon who recently endorsed Trump after dropping out of the race of the GOP nomination, declined to say exactly in what capacity he will serve or whether it’s a cabinet position. Carson said Trump’s decision to bring him into the presidential fold came after he sat down with the billionaire developer to talk about the future. As to whether his expertise in medicine or education will be tapped, Carson was mum. Honestly, my only fear with Trump is that he will make deals with Pelosi and Schumer. I want him to enforce his will upon them, not make deals. If Trump is elected president that will most likely mean he would also have a Republican Senate and House. If that is the case, you don’t make deals, you look to reverse the disastrous 8 yeas of Obama and that does not include make deals with far left Dems. Former Republican presidential candidate Ben Carson plans on endorsing Donald Trump. Carson, who just last week suspended his campaign for the Republican presidential nomination, plans to endorse Trump on Friday. Hmm … wonder what position Ben Carson would get in a Trump Administration? Last night during the 107th Republican debate on CNN, Trump referenced that Carson would be endorsing him. Talk about your Odd Couples. Could there be two candidates farther apart in style? I have to say that Ben Carson must have the thickest skin ever of anyone running for president or The Donald made him an offer he could not refuse. Remember when Trump likens Carson’s ‘pathology’ to that of a child molester during previous debates? Really Ben, this is who you would endorse? This is obviously a key endorsement and coming right ahead of the Ohio and Florida primaries. A key endorsement indeed. Conservative favorite Ben Carson, who last week suspended his campaign for the Republican presidential nomination, plans to endorse Donald Trump on Friday morning, according to two people familiar with his thinking. The endorsement, perhaps the most high-profile nod for Trump since New Jersey Gov. Chris Christie backed him, was finalized Thursday morning when Carson met with Trump at Mar-a-Lago, the luxury club owned by the Republican front-runner, the people said. The sources requested anonymity to discuss private conversations. Friday’s announcement will also take place at the club in Palm Beach, Fla., where the onetime rivals will appear alongside one another at a news conference. 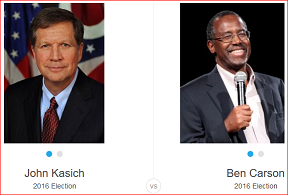 Daily Commentary – Friday, February 26, 2016 – Will Super Tuesday Be The End of the Carson and Kasich Campaigns?